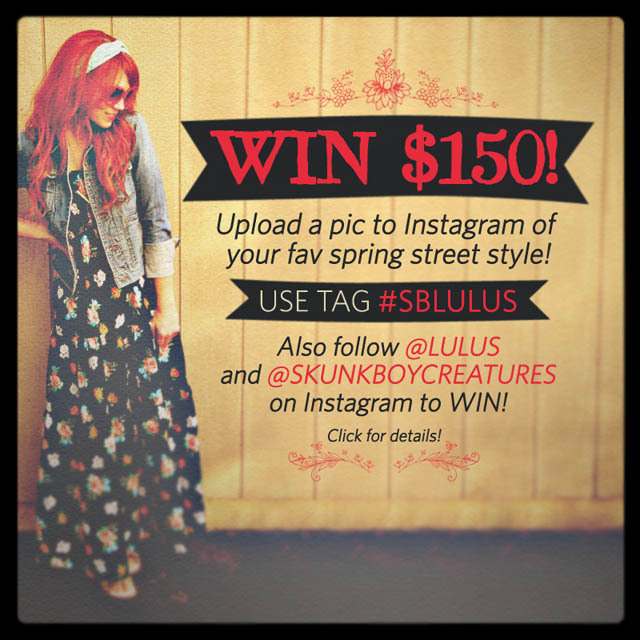 Skunkboy Blog: Lulu's + Instagram Contest! I wish I had instagram! ): Great giveaway though! This is a great idea! Really creative! So fun and so creative, I love it! Thanks Katie! If I enter more than one pic, an I disqualified? i was wondering, is this supposed to be a pic of yourself? or inspiration you pull off another site? I will find out for sure and get back to you shortly! Is it just any body you see on the street that you like there style? Where is your dress from? It's gorgeous!! It says May 29th at 12am, so does that mean the contest is over? or do we still have until tonight?